Blog post on What do we do with Inequality and what does that mean to You?This is the first of an ongoing series, with some dialogue and comment, we hope. It is are that we will take an extended passage from a journal and launch a discussion series based on this. But I encountered a rare passage from an author in MONTHLY REVIEW (not always the most vivid of progressive publications) that I found so compelling that I want the first “cut” to speak for itself. Imagine at a very practical level, what it is like to “grow up with advantages” in modern America—and without them. See how this passage captures that, and drawing implications should follow. Our source is from Michael Yates in the March 12, 2012 issue of MR, pp. 9-10 in an Article entitled “The Great Inequality,” … he quotes at length from his own book, Naming the System: Inequality and Work in the Global Economy (New York: Monthly Review Press, 2012) pp.58-59… (Yates is co-editor of Monthly Review and an economist, formerly of the U. of Pennsylvania): In Pittsburgh, Pennsylvania where I lived for many years, there is an extraordinarily wealthy family, the Hillmans, with a net worth of several billion dollars. One of their homes, along once fashionable Fifth Avenue, is a gorgeous mansion on a magnificent piece of property. About three miles east of this residence is the Homewood section of the city, whose mean streets have been made famous by the writer John Edgar Wideman. On North Lang Street there is a row of three connected apartments. One of the end apartments has been abandoned to the elements to the rodents and drug users. This is gang territory, and if you are African-American, you do not go there wearing the wrong colors. 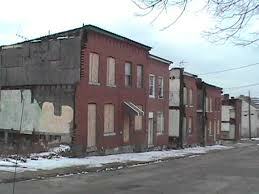 Poverty, deep and grinding, in rampant on this street and in this neighborhood, which has one of the nation’s highest infant mortality rates. Consider two children, one born in the Hillman house and another in the North Lang Street apartment. In the former there are two rich and influential parents. In the latter there is a single mother working nights with three small children. Let us ask some basic questions. Which mother will have the best health care, with regular visits to the doctor, medicine if needed and a healthy diet? Which child is more likely to have a normal birth weight? Which child is likely to get adequate health care and have good healthcare in early childhood? If the poor child does not have these things, who will return to this child the brain cells lost as a consequence? Which child is more likely to suffer the ill effects of lead poisoning? Which child is more likely to have an older sibling, just 12 years old, be responsible for him when the mother is working at night? Who will be fed cookies for supper and be entertained by an old television set? If the two children get ill in the middle of the night, which one will be more likely to make it to the emergency room in time? Which child will start school speaking standard English, wearing new clothes, and having someone at home to make sure the homework gets done? Which child will travel, and which will barely make it out of the neighborhood? As the two children grow up, what sort of people will they meet? Which will be more likely to meet persons who could be useful to them when seeking admission to college or looking for a job or trying to find funding for a business venture? Which will be more likely to be hit by a stray bullet fired in a war over drug turf? Which will go to the better school? Which will have access to books, magazines, newspapers, and computers in the home? Which one will wear worn-out clothes? Which will be embarrassed because his clothes smell? Which will be more likely to have caring teachers who work in well equipped and safe schools? Which will be afraid to tell the teacher that he does not have crayons and colored paper at home? Which will learn the grammar and the syntax of the rich? Which child will join a gang? Abuse drugs? Commit a crime? Be harassed by the police because he is black? When these two children face the labor market, which will be more productive? To ask these questions is to answer them. And when we considered that the poor child in the United States is better off than two thirds of the world’s population, we must consider that most of the world’s people live in a condition of deprivation so extreme that they must be considered to have almost no opportunities at all. They are almost as condemned as a person on death row in a Texas prison. Strong words? Yes. Mr. Yates would not back down from a single one of them, nor would we. Please let us know what You think. If the Russians–Putin– join up with OPEC in cutting oil production, you may want to take your road trip sooner, rather than later. Oil prices jumped in world markets October 5 after Russia’s energy minister over the weekend said Russia might attend an OPEC meeting to discuss the depressed state of oil prices. Russian Energy Minister Alexander Novak told the Sochi-2015 international investment forum October 3 that Russia and the Organization of the Petroleum Exporting Countries might organize a meeting between technical specialists. “Russia is ready to participate in discussing the situation emerging in the oil and gas markets,” he said. It would be a first for Russia, which as one of the world’s top three oil producers has never joined or cooperated with the price-setting cartel. 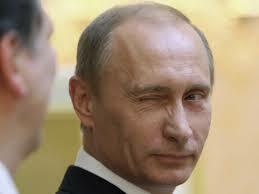 But today’s depressed oil prices have been crushing Russia’s economy and government revenues. Novak’s remarks sent oil prices soaring by 2.3 percent in London trading, with Brent crude settling up at $49.25 a barrel. “The news provided strong upside momentum in the oil market, as Russia has been thus far unwilling to cut oil production and cooperate with OPEC members to support current low crude oil prices,” said Myrto Sokou, analyst at Sucden Financial Research. FROM FORBES OF ALL PLACES: Obama as Economic Growth Hero? Some pretty impressive, if not perfect, info here! Pay attention, conservatives. I cover business growth & overcoming organizational obstacles. The Bureau of Labor Statistics (BLS) today issued America’s latest jobs report covering August. And it’s a disappointment. The economy created an additional 142,000 jobs last month. After six consecutive months over 200,000, most pundits expected the string to continue, including ADP which just yesterday said 204,000 jobs were created in August. Even though the plus-200,000 monthly string was broken (unless revised upward at a future date,) unemployment did continue to decline and is now reported at only 6.1%. Jobless claims were just over 300,000; lowest since 2007. Despite the lower than expected August jobs number, America will create about 2.5 million new jobs in 2014. And that is great news. Back in May, 2013 (15 months ago) the Dow was out of its recession doldrums and hitting new highs. I asked readers if Obama could, economically, be the best modern President? Through discussion of that question, the number one issue raised by readers was whether the stock market was a good economic barometer for judging “best.” Many complained that the measure they were watching was jobs – and that too many people were still looking for work. To put this week’s jobs report in economic perspective I reached out to Bob Deitrick, CEO of Polaris Financial Partners and author of Bulls, Bears and the Ballot Box (which I profiled in October, 2012 just before the election) for some explanation. Since then Polaris’ investor newsletters have consistently been the best predictor of economic performance. Better than all the major investment houses. “As this unemployment chart shows, President Obama’s job creation kept unemployment from peaking at as high a level as President Reagan, and promoted people into the workforce faster than President Reagan. “President Obama has achieved a 6.1% unemployment rate in his sixth year, fully one year faster than President Reagan did. At this point in his presidency, President Reagan was still struggling with 7.1% unemployment, and he did not reach into the mid-low 6% range for another full year. 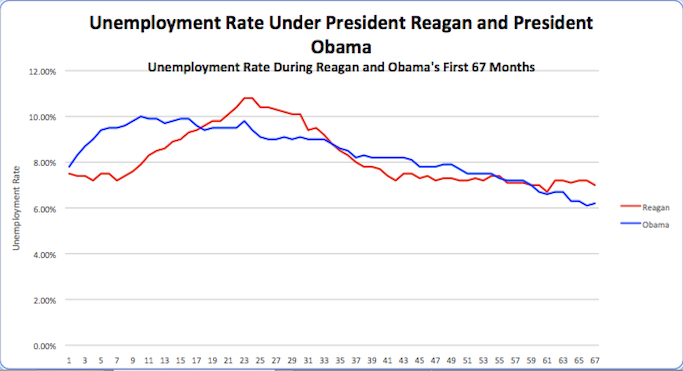 So, despite today’s number, the Obama administration has still done considerably better at job creating and reducing unemployment than did the Reagan administration. What about the Labor Participation Rate? Much has been made about the poor results of the labor participation rate, which has shown more stubborn recalcitrance as this rate remains higher even as jobs have grown. U3 v U6 1994-2014Deitrick: “The labor participation rate adds in jobless part time workers and those in marginal work situations with those seeking full time work. This is not a “hidden” unemployment. It is a measure tracked since 1900 and called ‘U6.’ today by the BLS. “As this chart shows, the difference between reported unemployment and all unemployment – including those on the fringe of the workforce – has remained pretty constant since 1994. “Labor participation is affected much less by short-term job creation, and much more by long-term demographic trends. 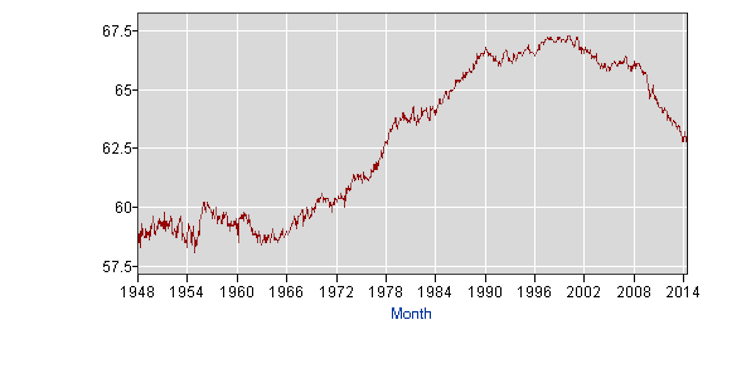 As this chart from the BLS shows, as the Baby Boomers entered the workforce and societal acceptance of women working changed, labor participation grew. “Now that ‘Boomers’ are retiring we are seeing the percentage of those seeking employment decline. This has nothing to do with job availability, and everything to do with a highly predictable aging demographic. When President Obama took office America was gripped in an offshoring boom, started years earlier, pushing jobs to the developing world. Manufacturing was declining in America, and plants were closing across the nation. This week the Institute for Supply Management (ISM) released its manufacturing report, and it surprised nearly everyone. The latest Purchasing Managers Index (PMI) scored 59, two points higher than July and about that much higher than prognosticators expected. This represents 63 straight months of economic expansion, and 25 consecutive months of manufacturing expansion. New orders were up 3.3 points to 66.7, with 15 consecutive months of improvement and reaching the highest level since April, 2004 – five years prior to Obama becoming President. Not surprisingly, this economic growth provided for 14 consecutive months of improvement in the employment index. Meaning that the “grass roots” economy made its turn for the better just as the DJIA was reaching those highs back in 2013 – demonstrating that index is still the leading indicator for jobs that it has famously always been. The stock market has converted the long-term growth in jobs and GDP into additional gains for investors. Recently the S&P has crested 2,000 – reaching new all time highs. Gains made by investors earlier in the Obama administration have further grown, helping businesses raise capital and improving the nest eggs of almost all Americans. And laying the foundation for recent, and prolonged job growth. Investment Returns Reagan v ObamaDeitrick: ”While most Americans think they are not involved with the stock market, truthfully they are. Via their 401K, pension plan and employer savings accounts 2/3 of Americans have a clear vested interest in stock performance. “As this chart shows, over the first 67 months of their presidencies there is a clear “winner” from an investor’s viewpoint. A dollar invested when Reagan assumed the presidency would have yielded a staggering 190% return. Such returns were unheard of prior to his leadership. “However, it is undeniable that President Obama has surpassed the previous president. Investors have gained a remarkable 220% over the last 5.5 years! This level of investor growth is unprecedented by any administration, and has proven quite beneficial for everyone.